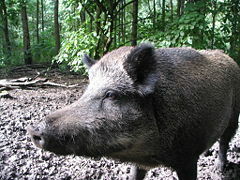 The Department of Natural Resources is asking hunters to help root out feral pigs in Wisconsin. The state has been working to limit its population of feral pigs, and DNR wildlife specialist Brad Koele says hunters can be a major part of that effort. Officials are calling on those heading into the woods this fall to either shoot any feral pigs they see or at least report sightings to the DNR. Koele says the wild hogs are a threat to the state because they destroy crops, attack wildlife, and carry diseases. Feral pigs were the source of a pseudorabies outbreak in Clark County last year. The animals have been spotted in at least 29 Wisconsin counties.